This is something I’ve been trying to do for a while, but never took the time to do it. 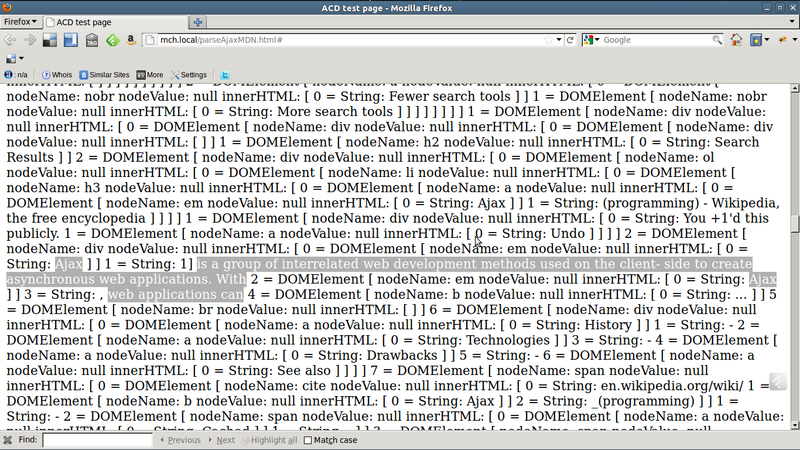 I was always curios to see if it was possible to get the rendered source code of a web site. Recently I was faced with a situation that I needed to get some data from a wesbite. However the website didn’t provide an API. 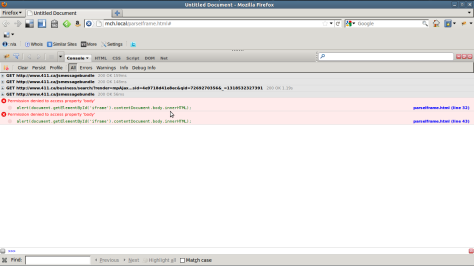 So I thought, let me get the source code parse it and extract the data from it. What I wanted was to get the rendered source code, the one with the constructed DOM object, not the one served from their server. 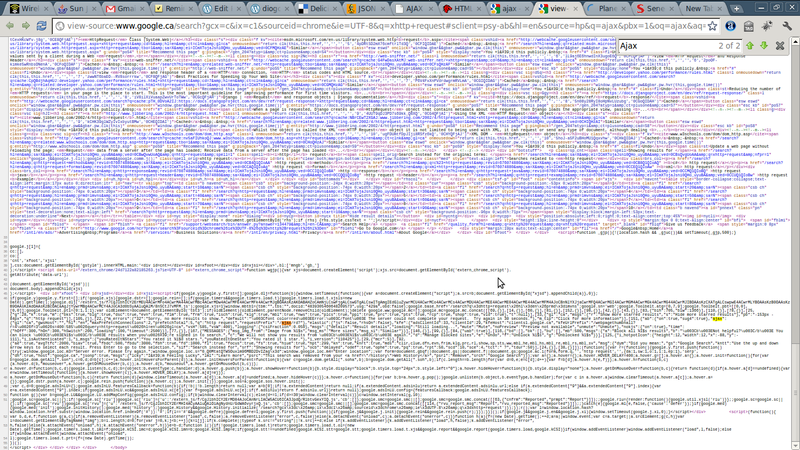 What made me realize the task was possible was the inspect element of google chrome. 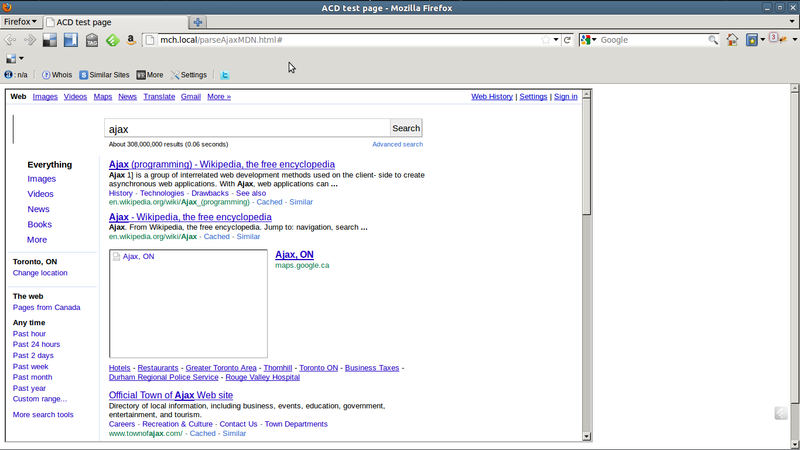 Using the inspect element it is possible to see the rendered html of any website. With that mind set I first started hacking the inspect element tool of chrome. The first results from my search mentioned the use of iframes to load a page, and then access the DOM object of the iframe from the parent page. I gave it a try, and it worked! The way I did it was I created two files, one file was the parent page, the other was the one would be loaded in the iframe. I was able to access DOM object of the iframe and perform any operation wanted. However, here it comes the trick part. I can only access the DOM of an iframe, if the page loaded in the iframe belongs to the same domain as the parent page. So when I tested with 411.ca, for example, it threw a permission denied error. With that option out of the way, I started looking for different ways to do what I wanted. 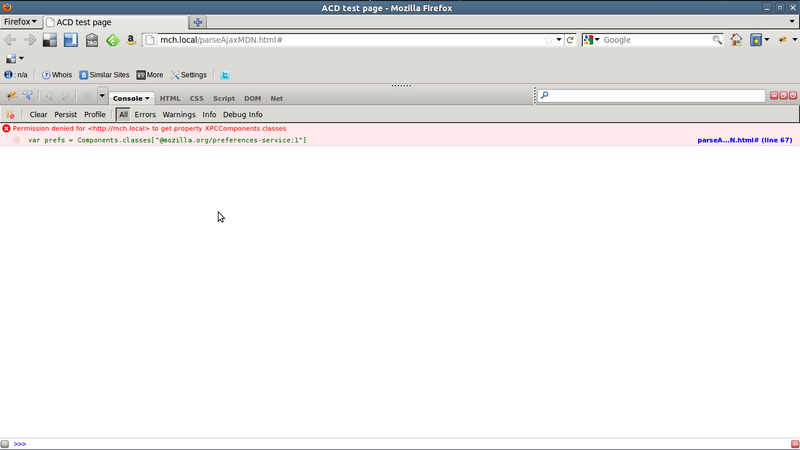 One idea I had was to make an ajax call, and then load the response(the html source code) in the iframe of my page. So I wouldn’t have the problem of permission denied when trying to access the DOM object of the iframe, since I would loaded the source code from the parent page. It is easier said then done. The same problem I had trying to access the DOM of the page loaded from another domain in the iframe, I had trying to request the page from another domain. I couldn’t make a XHR to a page on a different domain. Even tough I hit another wall, I felt that I was getting closer to a solution. This library is amazing. 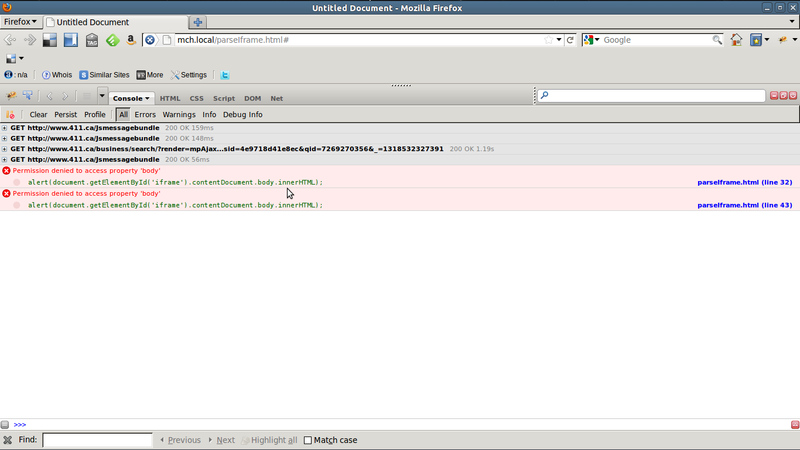 It is written in perl, so it uses the LWP::UserAgent and HTTP::Request classes to perform the operations. I haven’t fully understood the library yet, but by looking at the source code, it look like it creates a different header for the request so it matches the one from the url being requested. So by doing that the cross-domain restriction doesn’t apply. Again, I’m not sure, for more information just contact Bart Van der Donck , he is the guy who wrote the library. 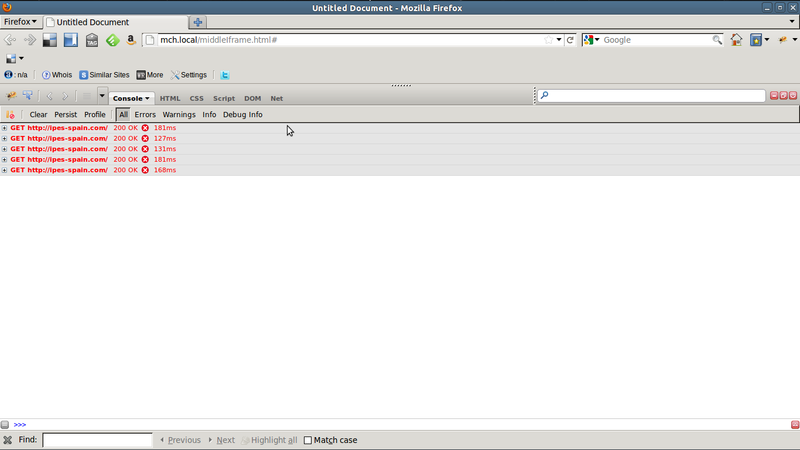 Another tool I also found it very cool was the HTML to DOM parser provided by Mozilla. Again with the help of google I found that by adding this code before trying to load a component it would give access permission. In the end, putting all the pieces together I was able to request a page from a different domain, load it in my website, and manipulate the DOM object of the requested page. Here is a dump of the DOM object. 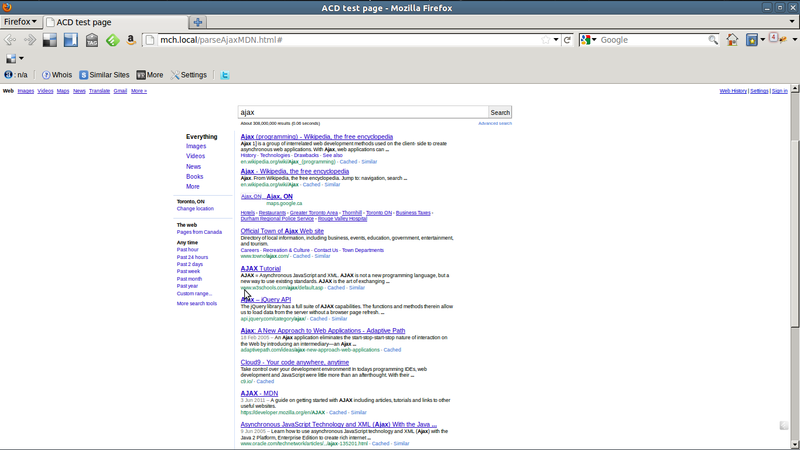 Highlighted are the only two occurances of Ajax on the page, and they are no from the search result. It is even possible to load the whole page in the parent page and not even use an iframe.